I have this thing about dipping things. And when I first started keto I felt robbed of things like dipping tortilla chips in salsa or guacamole and resented celery sticks dipped in sour cream dips because they couldn’t be dipped in things generally served on Cinco de Mayo. Like a delicious Mexican dip. But I got over that real fast once I came home from Chipotle with like a pound of extra guac and instead of eating my meal, started frying up some cheddar cheese and broke it into chips to dip. I’m like the MacGyver of cravings, I’ll figure it out if the craving is strong enough. But there’s really no reason why something as simple as a five-layer dip Mexican dip needs chips. I mean, don’t they usually break anyway? Then you’re the odd duck at the party getting scowled at because you’re knuckle deep in guacamole fishing your tortilla out. So this recipe you won’t need chips for—it’s eaten with a fork (yay!). Because whoever wanted to share that bowl of 5-layer dip anyway? Not me. SEE IF I CARE IF YOU STOP EATING IT AFTER I DOUBLE DIP! In a medium bowl, mash together avocado, lime juice, cilantro, onion, tomato, garlic, and salt. Cover the guac and refrigerate while you make the beef. In a medium skillet, cook the ground beef over medium heat until it’s crumbled, about 10 minutes. If the beef has a TON of extra fat bubbling up after it cooks (usually if not grass-fed or an 85% mix), strain out the grease and put back in the pan before adding water and seasoning. A little is totally fine. Stir in the water and taco seasoning. Reduce the heat to a simmer and cook for 10 minutes. Transfer the meat to four small bowls (or two large bowls for two servings). Top with sour cream, then the guacamole, then the lettuce, then the cheddar cheese. Finally, drizzle the cayenne pepper over the top to your liking. Instead of using store bought guacamole I make this simple guacamole recipe first. It’s super easy to make and tastes even better than the stuff you buy at the store. 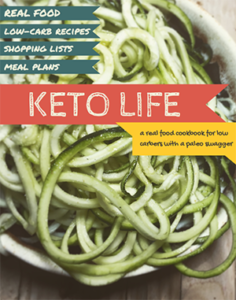 Hi there, I am so happy to find your blog as I am about to embark on a Keto WOE. I am trying to print this recipe but the link that opens up reveals a blank. Can you verify this and let me know when it’s ready to be printed? Thanks lots!! Dreamer68 Hi Dreamer, I can’t replicate the same problem on my end. Do you have pop-ups blocked? It does open in a new tab. voila, your precious recipe is now on my TO EAT list. Thanks SO MUCH!!! Absolutely love this recipe! My kids, husband and I all eat every bit, I add a few pork skins to top it off and give it that extra crunch ! Love this recipe but confused with the fats, carbs, protein section as it shows with %, I’m guessing this should be grams? And not showing calories. Hi, those are the keto macros — meaning 66% of calories come from fat, 2% from carbs, and 32% from protein. As a keto blog, I’ve been told my my readers that net carbs (3) and these macros are the most important thing they want to know, so that’s why I included them here this way. This sounds delicious! I’m going to make this for my family soon! I can also see serving it with thick strips of bell pepper for dipping!